Location. This famous mining district is in western Nevada County in the immediate area of the town of Grass Valley. The Nevada City district adjoins it on the northeast and the Rough-and-Ready district is to the west. History. Placer gold was first found in Wolf Creek in 1848 shortly after Marshall's discovery at Coloma. The earliest mining was done by David Stump and two companions who came from Oregon. The shallow placers were rich but were exhausted quickly. Gold-bearing quartz was discovered at Gold Hill in 1850 and soon afterward at Ophir, Rich, and Massachusetts Hills. Quartz mining soon developed into a major industry that was to last more than 100 years. The Gold Hill and Allison Ranch were the leading lode mines during the 1850s. Mining was curtailed somewhat during the Comstock rush of 1859-65, but the mines were productive again in the late 1860s. The camp declined in the 1870s, and by 1880 only the Empire and Idaho mines were active. In 1884 the North Star mine was reopened and activities increased; the North Star, Empire, Idaho-Maryland, Pennsylvania, and W.Y.O.D. all were highly productive. B ' v 1900, the Idaho-Maryland mine had yielded a total of $12.5 million. From 1900 to 1925, the North Star and Empire mines were the largest producers, the Idaho-Maryland having been idle in 1901-19. By 1928, the North Star had had a total output valued at $33 million. In 1929 the Empire and North Star groups were purchased by the Newmont Mining Corporation. This merger, which resulted in the Empire-Star Mines Co., included other important mines, such as the Pennsylvania, W.Y.O.D., and Sultana. From 1930 to 1941, the district was enormously productive. The 1930-40 output of Idaho-Maryland Mines Corp., which included the Idaho-Maryland and Brunswick mines, was $26.7 million. The Empire-Star group yielded 1,074,284 -ounces of gold from 1929 to 1940. 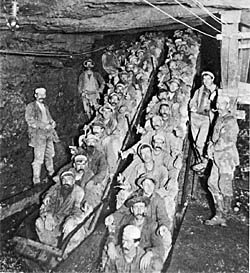 Nearly 4000 miners were at work in the mines during the 1930s and early 1940s. The mines were shut down during World War II, but the Empire, Pennsylvania, North Star, and Idaho-Maryland reopened soon afterward. However, operations gradually decreased; the Idaho-Maryland stopped gold mining in 1956 and the Empire-Star group in 1957, closures that ended nearly 106 years of gold-mining operations in the Grass Valley district. Some tungsten ore was mined in 1954-57 at the New Brunswick unit of the Idaho-Maryland mine. Grass Valley was the richest and most famous gold-mining district in California. The value of the total output of the lode mines is estimated to have been at least $300 million, and the placer mines yielded a few million dollars more worth of gold. The two largest operations, the Empire-Star and Idaho-Maryland groups, had total outputs of $130 million and $70 million, respectively. Many famous mining engineers and geologists worked in the Grass Valley district. A number of important inventions and improvements were made in mining and milling equipment in the Grass Valley gold mines. 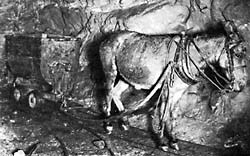 Many of the miners were of Cornish descent and were often known as "Cousin jacks". For many years the town and the mines were served by the Nevada County Narrow Gauge Railroad, which extended north from Colfax. A few historic mine structures are still standing, but most of the extensive surface plants of the major mines have been dismantled. The 61d power house at the North Star mine and its 32-foot Pelton wheel are part of a Nevada County historical display. Geology. An elongated body of granodiorite is in the central portion of the district. This body is five miles long in a north-south direction and 1/2 to two miles wide. It is intrusive into older metamorphic rocks and itself is cut by various dike rocks. Immediately east and west of the intrusion arc dark greenstones classified as metadiabase and metadiabase porphyry (so-called "porphyrites"), and continuing to the northeast are amphibolite schist, serpentine, gabbro and diorite, and slate. Just north of the granodiorite and to the southwest are slates, phyllite, quartzite, and schist of the Calaveras Formation (Carboniferous to Permian). A number of intermediate to basic dikes are present also, as well as a few aplite and granite porphyry dikes. Overlying part of the district to the east and to the northwest are Tertiary gravels, in turn largely overlain by andesite. Ore Deposits. This is the most heavily mineralized and richest gold district in the state with a very large number of productive veins in a relatively small area. The veins fall into two major groups: 1) those of the granodiorite-greenstone area, which have gentle dips, and 2) those of the serpentine-amphibolite area, with steep dips (see fig. 8). The veins of the granodiorite area are either in the granodiorite or in the adjacent greenstone, entering the granodiorite at depth. One group of veins strikes north and dips gently (about 35' on the average) either east or west. This group includes the Empire, Pennsylvania, Osborne Hill, Omaha, W.Y.O.D., and Allison Ranch veins. The other group of veins in the granodiorite strikes west or northwest and dips gently north. The North Star and New York Hill veins are included in this group. In the serpentine-amphibolite area the veins strike northwest and dip steeply southwest; a few dip northeast. These occur mostly in the amphibolite near or at the serpentine contact. The Idaho-Maryland, Brunswick, and Union Hill mines are here. The veins usually range from one to 10 feet in thickness and consist of quartz with some calcite and ankerite. They fill minor thrust faults. Many veins contain several generations of quartz. There are numerous northeast-striking, vertical or steeply-dipping fractures or "crossings" that commonly are boundaries of ore shoots. The' ore contains free sold and varying amounts of sulfides, chiefly pyrite. Present in smaller amounts are galena, chalcopyrite, arsenopyrite, sphalerite, and pyrrhotite. Galena is commonly associated with gold. The ore shoots vary considerably in size and shape, and the distribution of gold within 'the shoots is erratic. Some have pitch lengths of up to several thousand feet, and the veins have been developed to inclined depths of as much as I 1,000 feet. Much specimen ore has been found, but milling ore usually averaged from 0.25 to 0.5 ounce of gold per ton. Coarse-grained scheelite is present in several veins, notably in the Union Hill and New Brunswick mines. Mines. Ajax, Alaska, Alcade, Allison Ranch $2.7 million, Alpha, Bella Union, Ben Franklin 5750,000, Big Diamond, Black Hawk, Bow, Boundary, Buena Vista, Bullion, Cassidy (Linden), Centennial $500,000+, Cheranne, Coe $500,000+, Conlan, Crown Point $130,000+, Daisy Hill, Dakota, Diamond, East Star, Empire, Empire-Star group $130 million, Empire West,- Empress, Eureka $5.7 million, Gaston, General Grant, Gladstone, Golden Center (Dromedary) $2.5 million+, Golden Gate, Golden Treasure, Gold Hill, Gold Point, Goodall, Granite Hill, Grant, Hartery $350,000, Hermosa, Heuston, Homeward Bound, Houston Hill, Idaho, Idaho-Maryland group $70 million, Independence, Inkmarque, Kate Hayes, Larimer, Le Duc, Lone Jack, Magenta, Mary Ann, Maryland, Massachusetts, Massachusetts Hill New Brunswick, New Eureka, New Homeward Bound, New Ophir New York Hill, Normandy-Dulmaine, Northern Bell, North Star, Norumbagua $1 million+, Oakland $100,000, Old Brunswick, Old Eureka, Old Homeward Bound, Omaha, Orleans, Osborne Hill, Peabody, Pennsylvania, Phoenix, Polar Star, Prescott Hill, Prudential $100,000, Republic, Reward, Rich Hill, Rocky Bar, Rose Hill $100,000+, Scotia, Sebastopol, South Idaho, Spring Hill $300,000+, Stockton Hill, St. John, Sultana, Syndicate, Telegraph, Union Hill $750,000, Wisconsin, Wyoming, W.Y.O.D.